The image above was created by artist Lee Blair in the 1980s for the Soquel Urban Design contest. As the winner of the contest, he subsequently painted the original signs positioned at the four entrances to Soquel. Over the years the signs deteriorated and were restored for the "Celebrate Soquel" sesquicentennial celebration through the efforts of the Soquel Pioneer and Historical Association. 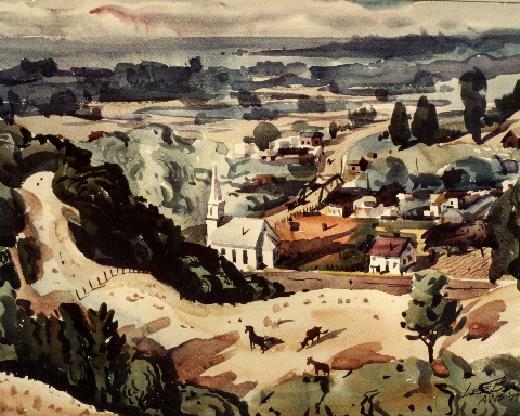 Lee Blair lived for many years in the hills about Soquel where he painted this view of the valley. He later presented the painting to the Soquel Pioneer and Historical Association. Lee Blair was born in Los Angeles. He was a member of the New York Water Color Club, American Watercolor Society, and the California Water Color Society. Born in Southern California, Lee Everett Blair attended Chouinard Art Institute in Los Angeles where he studied with Pruett Carter, Millard Sheets, Lawrence Murphy and briefly with Mexican artist David Alfarc Siqueriros. While in art school, Blair won several major awards for his watercolors, including a gold medal in the art division of the 1932 Olympics in Los Angeles for Rodeo. Blair met his wife Mary Browne Robinson (1911–1978) while in art school. He was President of the California Water Color Society in 1935 (at age 23) and in that role, began to arrange for Society art shows to travel nationally. From 1939-1942, Blair taught landscape painting at Chouinard and worked at Walt Disney Studios. In the late 1940s, the Blairs moved to Great Neck, New York where they started Film/TV Graphics Inc., an advertising company. The husband and wife team produced animated, training, and educational films, as well as television commercials. Blair served as the President of the New York Film Producers Association for two terms. In 1968, Lee and Mary moved to back to California, settling in Soquel in Santa Cruz County. Blair taught figure and landscape painting classes at Cabrillo College, as well as film animation at the University of California Santa Cruz. On July 26, 1978, Mary Blair died of a brain hemorrhage. In 1983, Blair was awarded a lifetime membership to the American Watercolor Society in recognition of his “… unusual achievement in the advancement of watercolor painting in America.” Lee Everett Blair died in 1993 in Soquel, California.